It is easy to make homemade window cleaner and only takes a few simple ingredients that you likely already have in your pantry. Making your window cleaner from natural ingredients in your home helps to remove the harmful toxins like propylene glycol, Mirapol Surf S-210, Liquitint Sky Blue Dye, and many others, from your house. Using natural ingredients that you find in your home, also helps to eliminate dangerous chemicals from damaging the environment. 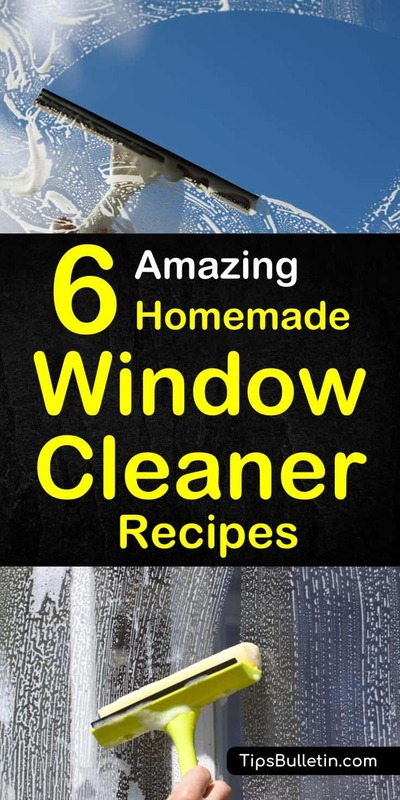 Here are several great homemade window cleaner recipes that will not only get your windows clean but will save you money as well. One of the main complaints about many of the commercial window cleaners, other than the harsh chemicals, is that they tend to leave streaks on your windows. This is where our homemade lens cleaner recipes came in. You can make a general window cleaner using water and distilled white vinegar. The vinegar will remove any film that has developed on your windows and thoroughly gets rid of any smudges you might have while leaving your windows free of streaks. Fill the glass spray bottle with all the ingredients and shake to mix thoroughly. Spray the solution on your windows and wipe clean with a lint-free cloth. If your windows are filthy, you’ll want to pre-wash them with soapy water to remove the dirt and grime. Lemon juice works a lot like the vinegar. The acidic nature of lemon juice cuts through grease that may have accumulated on your windows and helps to polish the glass surface. Mix the warm water and the lemon juice and pour into a glass spray bottle. Spray the windows with the solution and wipe dry with a clean, soft cloth. Lemon juice is also the base incredient for a very powerful homemade grout cleaner with baking soda. Ammonia is a suitable low-cost window cleaning alternative that will cut through dirt, fingerprints and hard water spots. Instead of using a soft cloth to dry the windows, use newspaper to prevent streaks from forming. Mix the warm water and ammonia and place in a glass spray bottle. Spray the windows with a light mist of the solution. Wipe the windows clean with a paper towel or newspaper, being sure to wipe in one direction. When driving, it is critical to be to see through your car windows. While you can use the same commercial cleaner that you use on your home windows, these tend to leave your car windows full of streaks. With just a few household ingredients, you can make a car window cleaner that will leave your windows free of dirt and streaks. Using a funnel, add the distilled water to a glass spray bottle. Next, add the rubbing alcohol and the vinegar. Reseal the container with the spray top and shake well. Spray the solution on your car windows and wipe clean with a microfiber cloth. See our how to clean car windows article for even more detailed instructions. We use this homemade car window cleaner a lot at home together with our car carpet cleaner when we tidy up our car – ask my husband. Our absolute favorite best DIY window cleaner is one that you can create using ½ cup ammonia, one tablespoon liquid dish soap, one pint rubbing alcohol and ½ gallon of water mixed. The tough cleaner will clean indoor and outdoor windows and cut through grime, grease, dirt, and more. Note: To get a much stronger cleaner based on vinegar and baking soda, check our unclog a drain cleaner recipe. Cleaning your home’s windows doesn’t have to be a difficult task. With the right tools and the following tips, you can quickly and easily clean your windows and avoid leaving streaks. You’ll need the following materials and equipment to do the job properly. When you are cleaning your windows, you need to choose a time of day when the sun isn’t shining directly on your windows. If the cleaning fluid dries too quickly, it will leave streaks and water spots on your windows. Using the brush, dust away loose dirt and cobwebs, making sure you get the sills, hinges, and tracks. In a small bucket, mix one cup hot water with one cup white vinegar. Using the sponge, wet the window with the vinegar and water solution. Rub the area to get rid of any dirt on the area. Wet the squeegee. Starting in the upper corner of the pane, bring the squeegee down in a straight stroke. Return to the top of the window and repeat the step. Make sure you are wiping the squeegee on the sponge or a dry, lint-free cloth after each stroke. When you are finished, draw the squeegee across the bottom of the window and, using the sponge or cloth, dry the window sill. Dampen a cloth with the all-purpose cleaner and wipe down the window frames. Rinse them with water and immediately dry with a clean, dry towel. Take your time and make sure that you are drying the area with a clean lint free cloth to avoid streaking. While vinegar tends to be the best homemade window cleaning product, you may not want to spend the time making any of the homemade window cleaning recipes listed above. For that, here is a list of the best commercial window cleaning products that you can purchase from Amazon. Best overall commercial window cleaner – Windex has time and again proven that it is the best overall window cleaner. Both the original Windex and the no-drip, streak-free version is excellent for cleaning your windows of dirt and grease and leaving them free of streaks. You can use it on both the inside and outside of your windows and can tackle tough grime instantaneously. Best low-cost window cleaner – If you are looking a less expensive, but powerful window cleaner, you can try Glass Plus. This cleanser is excellent on grease and grime and is less costly than some of the other window cleaning products on the market. This inexpensive product does a great job on both the inside and outside of your windows. Best natural window cleaner – If you want a window cleaner that is created from natural ingredients, Seventh Generation natural glass and surface cleaner is an excellent choice. While this product doesn’t do as good of a job as the other cleaners listed above, it is made from all natural ingredients making it not only safe to use around your family, but it is environmentally friendly as well. Best smelling window cleaner – The cleaner that smells the best is hands down Method natural glass cleaner. This cleanser can stand up to the toughest messes on both the inside and outside of your windows. Plus, the soft mint smell makes a nice change from the other overpowering glass cleaners. 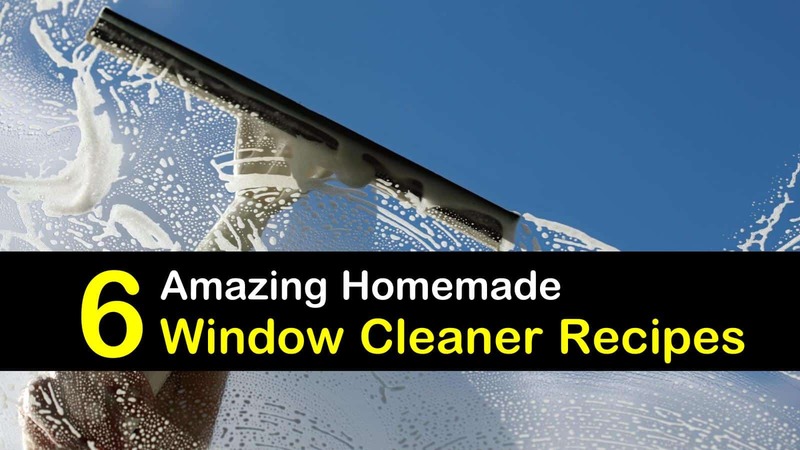 We’ve shown you several recipes for making homemade window cleaner and provided you with several suggestions for commercially produced window cleaners that you can purchase through Amazon. We hope you found the article helpful, and as always, if you know someone who would enjoy this article, please feel free to pass it along.